Okay, it’s time for a big confession: I have never really been into Ghostbusters. Don’t get me wrong, I don’t think it’s godawful and it certainly has its moments every now and then, but as something people like to praise as one of the greatest comedies of all time, I personally find it to be a little overrated. I never really got into the plot, some of the direction was a little too dry for my tastes, and aside from maybe one or two memorable quips, I never truly found it that funny either. Maybe that’s because I’ve not been much of a fan of director Ivan Reitman’s filmography in general (Junior, My Super Ex-Girlfriend and No Strings Attached being prime examples), but to me Ghostbusters was just another movie that happened to become popular. Everything else in the franchise, from the divisive sequel to the animated spin-off show The Real Ghostbusters, never really captured my imagination in the same way it did for many other people. So, all in all, Ghostbusters was never really my thing. So, when I heard the news that they were making a new version of the film, after a mooted third movie was in development for many years but never fully materialised, with people I genuinely liked working on it – including director Paul Feig, and a leading quartet of funny and talented women like Kristen Wiig, Melissa McCarthy, Kate McKinnon and Leslie Jones – I did find myself getting interested in how it would actually work. Nothing would detract me from my overall desire to see it, not even the immensely ugly backlash it has received online right from the word “go”, and I went in with an open mind and a hope that I might finally, after years of not really caring, get behind a Ghostbusters movie. And the final conclusion, after months of uncertainty and dread that it would indeed come under expectations, is that it’s… good. Yes, it’s just good. It’s not great by any means whatsoever, but neither is it the absolute worst thing to be associated with the art of cinema like a lot of people had prematurely decided. There are parts I liked, parts I didn’t, and parts I honestly couldn’t care less about… much like what I thought of the original Ghostbusters to begin with. In some respects, Feig and his crew have made a complimentary film that honours the legacy of the past while doing its own thing, one that is both serviceable and dispensable at the same time. You can tell that everyone involved definitely had love for what came before and did whatever they could to make the best movie possible with the very limited creative space they had been given by Sony (who, by the way, deserve a right telling off for what has to be one of the WORST marketing campaigns in recent memory), and while the end result isn’t great, for what it is it’s perfectly fine. To start, since I know a lot of you will be very anxious to know, what DIDN’T I like about the film? For one, again much like the original in my humble opinion, it’s not very funny. Feig has made some of the strongest comedies of the decade so far with Bridesmaids, The Heat and Spy, and has even reunited with The Heat co-writer Katie Dippold to pen the script here, but this sadly isn’t one of them; a lot of the humour isn’t very well thought out, with quite a lot of the jokes falling flat and sometimes going nowhere, which is hardly the fault of the actors (who we’ll get into shortly) but more of a script that doesn’t quite reach its comedic potential. It also possesses problems in the pacing department, since it takes a good while for the film to get truly rolling without much in terms of a satisfying build-up, and though it definitely picks up later into the film you still have to sift through a lot of awkward humour and a script that doesn’t quite match the previous films made by Feig. As a director, he’s definitely made the most out of a tight situation, but the script isn’t as strong as they’d like it to be. But luckily, there are plenty of things about the film I DID indeed enjoy. The main quartet work very well together and it’s not until they’re all finally working as a team – Wiig’s Erin, McCarthy’s Abby, and McKinnon’s Holtzmann are all scientists who are later joined by Jones’ streetwise subway attendant Patty – that they start to show real charm as a collective unit, enough to make you really want to see them save the day and also win over everyone’s respect. Chris Hemsworth, too, is a lot of fun as the team’s impossibly dumb receptionist Kevin, in a cute gender-reversal gag of superiors fawning over the attractive employee, and even manages to get one of the few genuine laugh-out-loud moments I had throughout the entire film (it’s near the end, and without giving anything away it involves Peter Pan). I also really admired the creativity that was put into the designs of the ghosts, the gadgets, and the use of practical effects over just making everything CGI, although it does go full-blown computer graphics for the otherwise-fun climax of the film, which involves a neat way to incorporate the iconic logo into the proceedings as well. So there you have it, folks: the new Ghostbusters is completely fine, though not without its fair share of flaws. It’s silly, it’s awkward, it’s completely harmless… and so was the original, so for me, it all finally comes full circle. 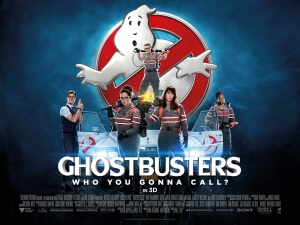 Ghostbusters has as many qualities as it does flaws, with its main cast and creativity levels being tons of fun, while the script lacks consistent humour and steady pacing, but it is absolutely not the disaster many were expecting – or even praying – it to be. If you’re at all curious, by all means check it out: you definitely won’t regret seeing it either way.